In 1868, a small mining town nestled between the hills of the Montana Territory is expanding rapidly, thanks to the Gold Rush. 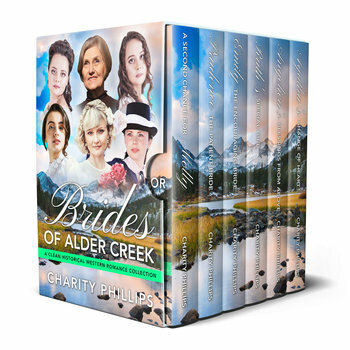 Follow the stories of a close knit circle of pioneer women as they support each other through the ups and downs of finding love in the Brides Of Alder Creek series! A Second Chance For Molly: A handsome, friendly face from Molly’s past reappears, and he doesn’t seem to have aged a day. The widow is more than happy to help the sweet, charming Bobby Wallace take care of his two daughters. But can they also rekindle the love they shared all those years ago? Prudence: The Patient Bride: Sweet, sorrowful Prudence has been promised to Mr. Isaac Wells, a wealthy gentleman with a limp and a mysterious past. Only once she’s married to Isaac does she begin to realize there’s something to be said for a marriage of convenience. Perhaps needing someone and loving someone aren’t so very different from each other after all. Emily: The Encouraging Bride: Schoolteacher Emily French has quite a lot in common with Mr. Nick Ascot, but there’s one problem. Is their friendship and potential relationship forever doomed, or will she find a way to help him heal from the trauma he endured as a child? Ruth’s Special Gift: Mrs. Ruth Kent knows she’s getting on in years now, and when the dashing Mr. George Banks holds a door open for her, he inadvertently opens the door for many other wonderful things in her life. But with his checkered past, Ruth begins not only to distrust him, but also her ability to tell a friend from a foe. Angelica’s Blessings From Above: Handsome and gentle Dr. Roger Sherman takes care of Angelica while she is ailing, visiting her every day to ensure she is well again in no time. As she reclaims her health, Angelica becomes interested in getting to know Dr. Sherman a little better. Is it possible that he might ever think of her as more than a patient in need of saving? Agatha’s Change Of Heart: Agatha never longs for marriage or settling down to raise a family; her passion has always been to own a successful business. But while staying in Mr. Wilder’s inn, she’s unexpectedly drawn to the shy, soft spoken innkeeper. If you enjoy wholesome historical Western romances, you’ll fall in love with this series of six heartwarming 20,000 word novellas. Copyright © 2019 · All Rights Reserved. Hope Meadow Publishing is a participant in the Amazon Services LLC Associates Program, an affiliate advertising program designed to provide a means for sites to earn advertising fees by advertising and linking to Amazon.com.